US-Israel hands off Gaza! Free Palestine! End the genocide! Global alliance of Filipino im/migrants Migrante International condemns in strongest terms the US-backed Israeli bombing in Gaza City that has killed at least 1,700 Palestinians, including 398 children and 74 senior citizens, and injured some 9,000 people and more than 3,000 children. The Israeli air strikes and military attacks in Gaza encroach upon the Palestinian people’s national sovereignty and right to self-determination and continue to endanger the lives of Palestinian nationals and thousands of migrants. Migrante International stands in solidarity with the Palestinian people in their defense of their homes, livelihood and citizens. We join peoples of the world in condemning the US-backed genocidal war being waged by Israel. Israel is the biggest recipient of US military aid. Migrante International calls for a stop to the bombings and killings, fearing also for the lives of overseas Filipino in Gaza. 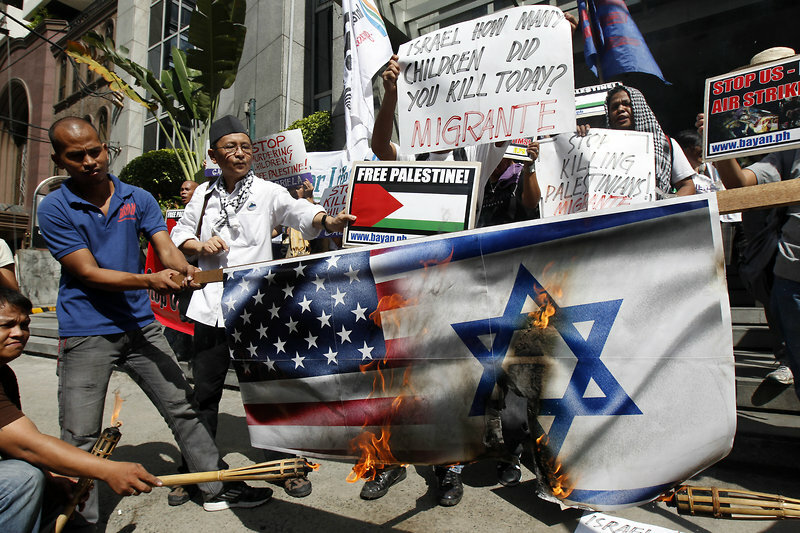 There are around 120 Filipinos in Gaza, and some 36, 000 Filipinos in the West Bank. We also vehemently criticize the BS Aquino administration’s continued support for the US despite its war-mongering in Gaza and elsewhere in the world. The BS Aquino government’s dogged support for US interventionist wars endangers the lives of hundreds of thousands of Filipinos in Gaza, Israel, Libya, Syria, Afghanistan, Iraq, and wherever the US plans to strike.